The dollar gained today after unemployment figures showed a fall in the expected number of new claims. The data helped to confirm that the US labor market remains in good standing so heightening expectations that interest rates will rise this year. New claims for unemployment dropped to 281,000 last week latest figures from the US Department of Labor showed. The number for the previous week was also revised down slightly to 296,000. This took the four week moving average up slightly to 282,000. This remains well below the 300,000 level which most economists consider necessary for a robust economy. The dollar made the biggest advances against the euro. This helped to push the benchmark US dollar index up by half of one percent. 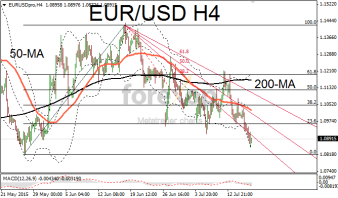 EUR/USD has been in a bearish configuration for the past two weeks and most of the indictors continue to point towards weakness in the short term. 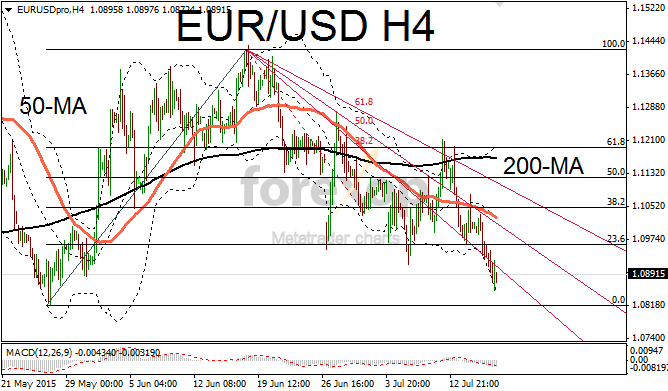 EUR/USD broke down below 1.09 for the first time since the beginning of June. Support should be encountered around 1.0883 and lower at 1.0822. The euro continues to come under pressure due to uncertainty around the burden that slower economies are placing on the single currency. Today the ECB announced that its total exposure to Greece is a colossal 130B euros. Mario Draghi, the head of the ECB also announced that it had increased its emergency liquidity aid to Greek banks to 900M euros per week. USD/JPY broke above 124 keeping the level well clear of the 50-day moving average. The yen and Swiss franc are seeing a gradual unwinding of long positions as risk perception falls. The VIX (volatility index) saw a further big drop today extending down to 12.2. This comes after reaching a level of 20 last week during the crash in Chinese stock markets.